My name is Keith M. Baker, A.S.N. 16189609 [530th]. 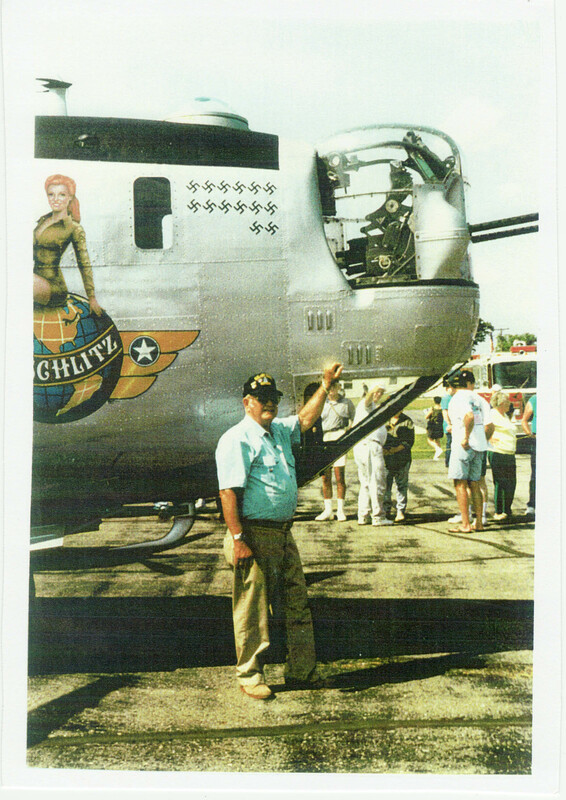 I was nose gunner on Marvin E. Gardner's crew; we flew a new model "M" B-24 from Fairfield, CA, to Biak, N.G. We left on the night of Dec 2, 1944, my 19th B.D.! We refueled on the islands and arrived on the 5th or 6th. We flew over the Arizona's masts that were still sticking out of the water. And landed at Hickham field. 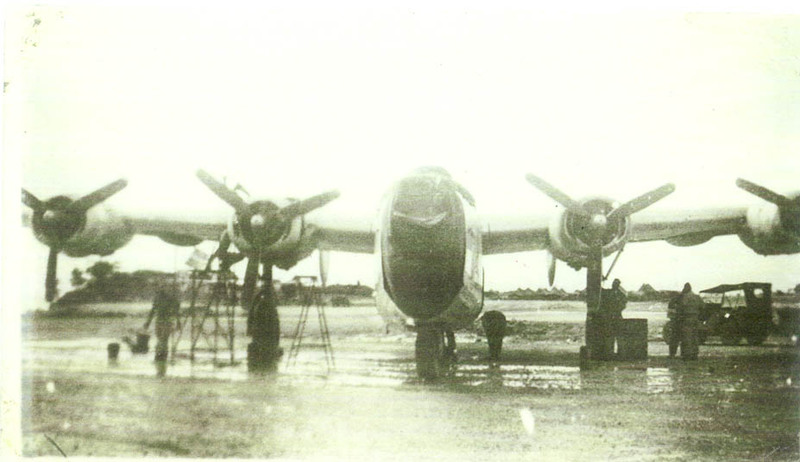 I thought we had it made, but had to turn our new airplane over to the aircraft pool, and our first mission was Wewak N.G. in a converted "J" model that had a hydraulic turret in the nose instead of the Emerson Electric that I had been trained in; it was too quick to operate and quite jerky. After this we were in Nadzab N.G. and from there to Australia to join the 380th B.G. in a C-47 A.T.C. We flew across New Guinea, and got as far as Townsville Australia. The monsoon kept us there around 3-4 days. We could go to town to report back to base each day; there were 3 or 4 old B-10s at the field, and several Beaufighters. Also some P-40 Warhawks. We bought fresh fruit there, and I ate a whole sack of plums; I really got sick, if you know what I mean! We joined the outfit soon after that, after stopping at a sheep ranch in N.T. to refuel. Lots of flies there. They were getting ready for the move to Mindoro P.I. 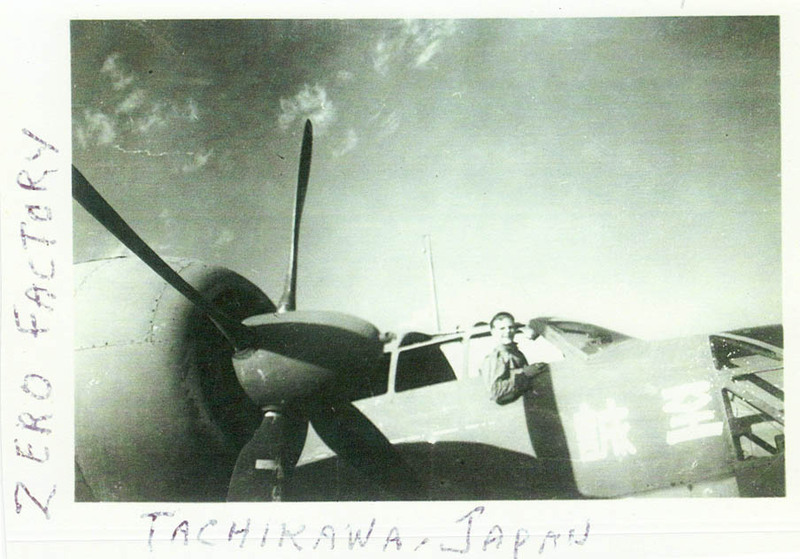 Most of the rest of our missions were from there, and a flew from Okinawa. The new B-24 "M" we flew over had the serial number on the vertical stabilizer; I remember the last 4 numbers as 1838. Several years ago I sent an inquiry to Michael Claringbould of Australia, a man dedicated to knowing everything about the 5th A.F. He has records of all or most of the bomb groups and most other aircraft of the fighting fifth! He sent me a letter declaring that it survived the war intact, and was probably used mostly as a fat cat to haul goodies for some high brass. I don't really care, because it was a good aircraft and am glad it didn't get all used up. I am 84 years old, and still am in contact with our pilot, M.E. Gardner (he's in Utah), and we have phone conversations once in awhile. In 2005 I had open heart surgery, and had just gotten home, and he was on his way home from the Williamsburg reunion, and he stopped to see me. It was quite an emotional time and I really enjoyed it. I'm having these original pictures copied and you can use them any way you like. Keep on keeping on, and keep the Flying Circus alive and well. I am proud to have served in the 380th. The forgotten 5th! P.S. If anyone wants to contact Michael John Claringbould, they can probably get him on the Internet. He has some good books out on the 5th AF. Lots of pictures! This man has dedicated his life to preserve the 5th A.A.F. in WWII and deserves our recognition! This guy's name is Joe Offner of the 530th Sqdn. 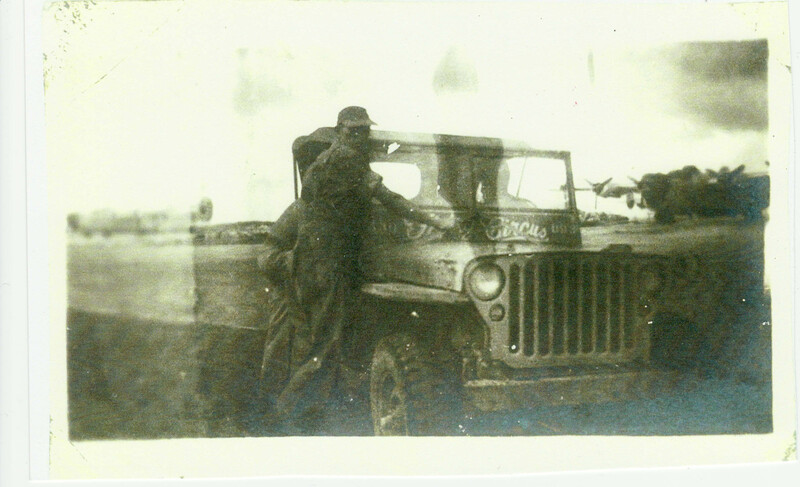 He was a mechanic, and his jeep was called "DAMFINO"!